As we're getting down to the wire, and I've washed more baby clothes than I can count, I finally got around to packing Baby Girl's hospital bag. I know, I know. The hospital will have everything we need and all I need is a going home outfit for her. Well...I don't care. Like any girl (or any Cannon girl for that matter), she needs to have options. In truth, we received so many adorable and amazing things for the baby that I couldn't help but overpack for her. I plan to have some different outfits for her to wear for photos and when we have visitors. Even if we end up using 1 out of the many things I've packed, I'm ok with it. First up, I packed up a gorgeously soft pink stroller blanket from my parents and I bought her a sweet little baby Northface bunting. These are for the day we go home...in case it's very cold, the suit is thin enough for the carseat and the blanket can cover her on top of that. Next up, 1 aden+anais swaddle blanket and a receiving blanket. I brought two very different ones so that we'll have nice photos of her with each. And while we're talking about photos, I packed a few hats that she can wear throughout the stay. I threw in a couple of diapers and travel wipes, just in case. I know we won't use these in the hospital at all, but if we need a pitstop on our 10 minute ride home, I'll be happy I came prepared. Right? Lastly, I added a soft bear hat, some booties, socks and mittens. And lastly, I plan to also bring the Boppy pillow. Next up is putting the finishing touches on the bag for myself, which I'll share next week! I'm so excited for these final weeks (or days?). 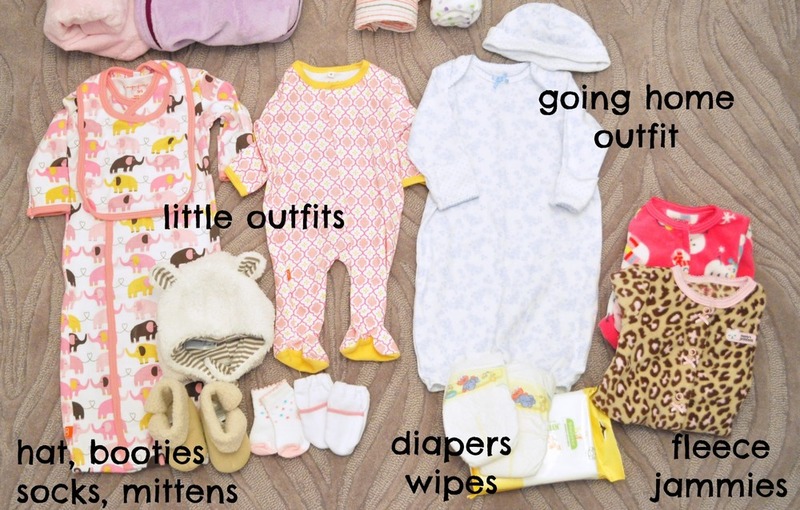 It's unreal to imagine that my sweet baby girl will be filling up these little outfits so soon.